Plaza Nueva One of the most popular squares in Granada. This pleasant square sits beneath the Alhambra´s imposing Torre de la Vela. Linking the Paseo de los Tristes with the main streets of Gran Via and Calle Elvira. 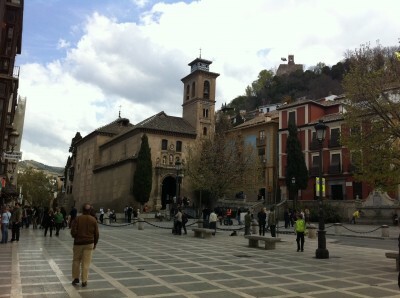 This square is often a place for meeting up with friends and is witness to many weddings in the Santa Ana church. Plaza Nueva was built to cover the Darro River after the conquest of Granada. The river for many years has run underground. As early as the year 1515 they decided to cover the whole space over creating a large esplanade. The 4 bridges that connected the Alhambra with the lower part of Granada were increasingly insufficient for the traffic at that time. The Santa Ana church was built by Christians in the 1537. As with many Granada churches this was built on the site of a mosque. Still visibly noticeable when contemplating the church today, with mudéjar style details. The base for designing the current bell tower would have been the minaret of the Ibn Twbaaa mosque. 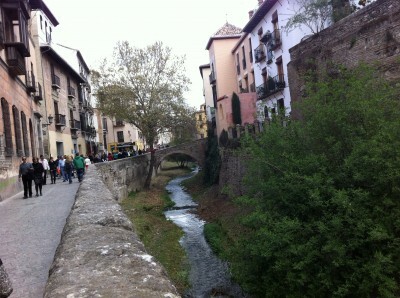 To the right of the Santa Ana church is the fountain called Pilar del Toro (bulls fountain) this was put here in 1941. 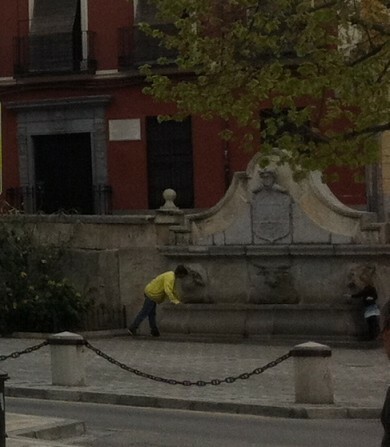 The centre of the fountain has a bull on it with two young boys either side. 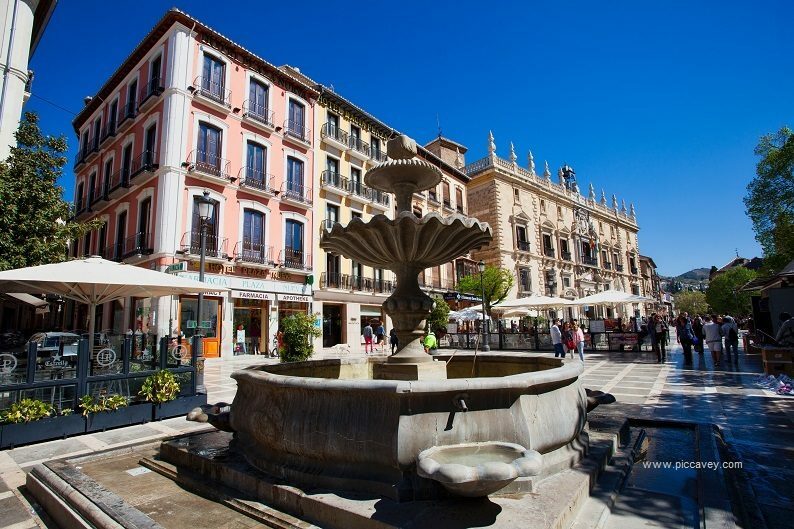 This fountain dating from the 16th century was originally situated in the Calle Elvira and was moved to it´s current spot in Plaza Nueva in 1941. Just above this fountain is the street named Calle Santa Ana runs alongside the church of the same name. There is a great café restaurant on this street named also Pilar del Toro. 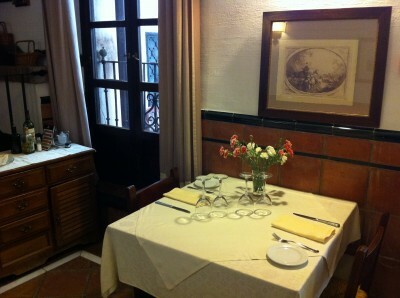 The setting is a 17th century house that doesn´t give much away from the entrance but is lovely and cool inside. This is actually quite a large building with several floors, a delightful indoor patio with a fountain and plants everywhere. I feel like I´ve gone back in time when I set foot in here. 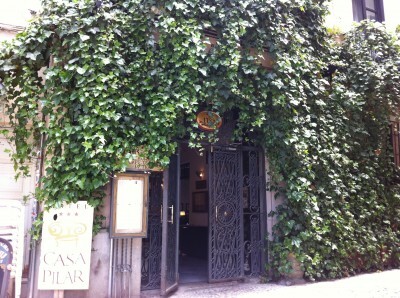 I didn’t realise that this place was actually a hotel (until I started to write this post) Hotel Casa del Pilar it must be delightful with just 12 rooms set in the middle of oldy worldy Granada. Anyway I digress…. I stopped off to have lunch here one Saturday in May. It was actually quite a hot day and when the waiter offered us a table outside I was unsure if it would be too warm. As I sat down I noticed the canvas canopies above the tables and the rotating ceiling fans. Wonderful. 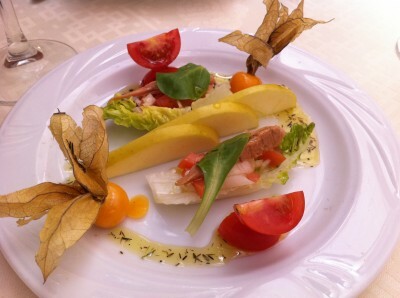 We ordered drinks and began to peruse the menu, meanwhile this colourful appetiser arrived with the drinks. Looking good! 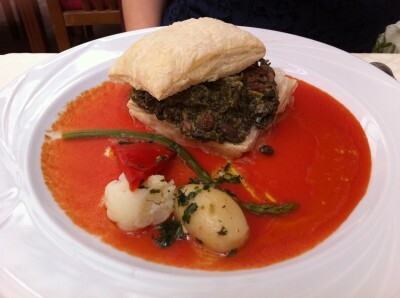 I ordered spinach puff pastry and white fish in a light mango sauce. 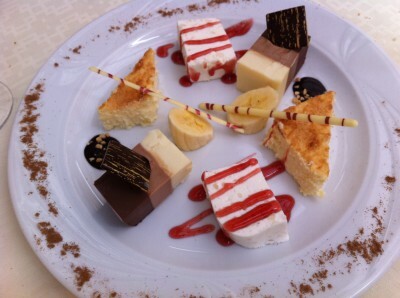 I was amazed at the quality of the food. Everything that we chose was fabulous. 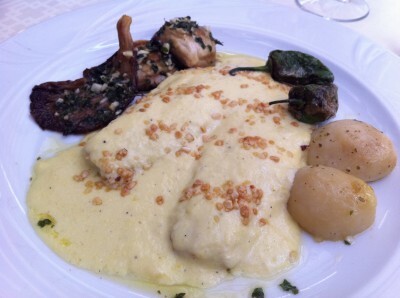 Usually one dish tends to shine over the other ones but here everything we selected was fantastic. The unusual choice of mango for fish sauce was unexpected but delicious. For dessert we chose a variety of desserts to share between the two of us. After lunch we went through to the lovely patio towards the entrance of the building. 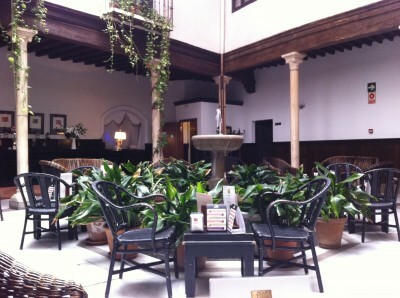 It is decorated with a fountain which provides a lovely sound in the space and it´s full of Aspidistra plants. A relaxing spot to have a coffee and a chat. 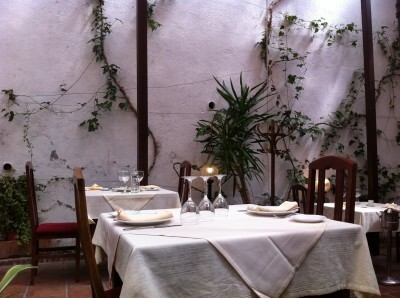 Although that I have actually lived in Granada for 6 years already and only just discovered this little gem. On the patio they had a list of cocktails and mojitos for evenings as well as coffees and a variety of different teas. I certainly will be coming back. I´m amazed that Plaza Nueva can still surprise me after all these years in city.